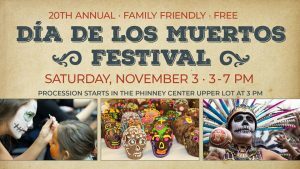 2oth annual family-friendly Día de Los Muertos Festival – free and across the street from Greenwood Chupacabra at the Phinney Neighborhood Association! “Celebrate Día de Los Muertos (Day of the Dead), a Latin American holiday honoring the dead with food, drink and festivities. It’s a time to commemorate the dead and celebrate their lives with family and friends. Our free celebration will begin with a community procession and dedication of a traditional altar for offerings to the deceased. Bring your offerings (pictures, momentos, small items) to the Phinney Center before or during the event to be included on the altar. (You can pick them back up at the Phinney Center by November 10).